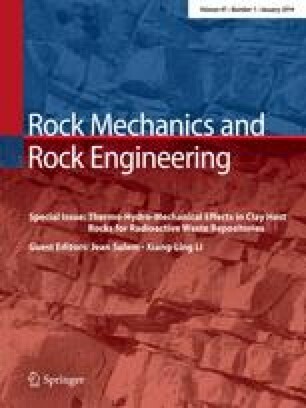 This study focuses on the characterisation of thermal conductivity for three potential host rocks for radioactive waste disposal. First, the heat conduction process is reviewed on the basis of an analytical solution and key aspects related to anisotropic conduction are discussed. Then the existing information on the three rocks is summarised and a broad uncertainty range of thermal conductivity is estimated based on the mineralogical composition. Procedures to backanalyse the thermal conductivity on the basis of in situ heating tests are assessed and a methodology is put forward. Finally, this methodology is used to estimate the impact of experimental uncertainties and applied to the four in situ heating tests. In the three potential host rocks, a clear influence of the bedding planes was identified and anisotropic heat conduction was shown to be necessary to interpret the observed temperature field. Experimental uncertainties were also shown to induce a larger uncertainty on the anisotropy ratio than on the equivalent thermal conductivity defined as the geometric mean of the thermal conductivity in the three principal directions. The support of ANDRA for the development of this work is gratefully acknowledged. Two Technical Meetings for the HE-D experiment and nineteen Technical Meetings for the TER and TED experiments were held and financially supported by ANDRA. Those meetings involved many fruitful discussions, in particular with Yannick Wileveau, Michael Jobmann, Michel Filipi and Nathalie Conil. The important work on the in situ experiments and the laboratory experiments, by ANDRA, EURIDICE, NIRAS.ONDRAF and NAGRA, is duly acknowledged.